Disney Pixar has released a new poster for The Incredibles 2, which serves as a precursor to the new trailer that will be released by the studio tomorrow. The poster features the entire Parr family, Bob (Craig T. Nelson), Helen (Holly Hunter), Violet (Sarah Vowell), Dash (Huck Milner) and baby Jack-Jack, who is starting to discover his super powers, as we can see in this one-sheet. While the Parrs, along with Frozone (Samuel L. Jackson) and Edna Mode (Brad Bird) are running towards a fight, Jack-Jack seems more interested in using his laser beam eyesight to taunt a raccoon. This poster also offers a glimpse at some of the new heroes that will be featured in this Pixar animated sequel, although they are barely noticeable on first glance, relegated to the background. While there were a few new characters introduced back in January, none of these heroes match up with what we've already seen. It's possible we may get our first formal introduction to them in the trailer coming tomorrow. Whoever these heroes are, they do look unique, with the hero on the far left sporting a large K on his chest, standing next to another guy with enormous arms. There are also two more slender heroes and two super creatures, one of which can fly. These characters, whoever they may be, will be joined by the new villains, Winston Deavor (Bob Odenkirk) and his sister Evelyn Deavor (Catherine Keener), who both run a massive telecommunications company. This sequel will also introduce fans to Rick Dicker (Jonathan Banks), leader of the Super Relocation Program, who tries to keep the Parrs' true identity a secret, until the entire division is shut down. The other new characters revealed in January are Voyd (Sophia Bush), a super who is a huge fan of Elastigirl and has the ability to create voids that allow objects to disappear and reappear through space and time and a foreign Ambassador (Isabella Rossellini), who is determined to make superheroes legal again. The sequel follows the Parrs, as Helen is tasked to lead a campaign to bring back the Supers, although their mission hits a snag when a new villain emerges to pose a deadly threat to them all. 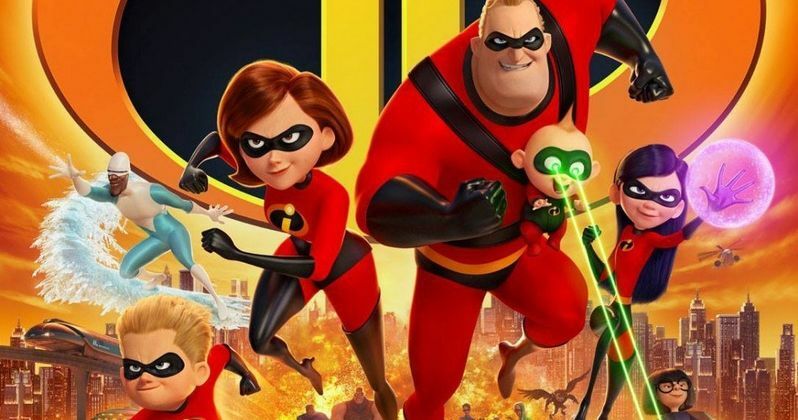 Along with voicing baby Jack-Jack, The Incredibles director Brad Bird returns to write and direct this sequel, which has been set for release on June 15, putting the animated sequel up against Warner Bros. comedy Tag and Sony's remake SuperFly. John Walker (The Incredibles, Tomorrowland) and Nicole Grindle (Sanjay's Super Team short, Toy Story 3 associate producer) serve as producers. The original film The Incredibles opened to an amazing $70 million in 2004, which, at the time, was the second-largest opening ever for an animated movie. It would go on to earn more than $633 million worldwide, and would later win the Academy Award for Best Animated Feature." Take a look at the new poster, courtesy of The Incredibles Twitter, and check back tomorrow for the new trailer.